Owen Matthews, author of the highly acclaimed memoir “Stalin’s Children,” investigates a swashbuckling lover and adventurer known mostly from the Russian stage. Since he was a teenager, Owen Matthews has been obsessed with the flamboyant adventurer Nikolai Rezanov. Though Rezanov’s vision of a Russian America at the dawn of the 19th century is virtually unknown to Americans, “every Russian knows him as this romantic lover,” said Matthews, a journalist and former Newsweek bureau chief in Moscow. The young Matthews knew by heart the hugely popular Russian rock opera “Juno and Avos.” The story is inspired by the love affair between Rezanov and Conchita Arguello, the teenage daughter of the local Spanish governor in California. In researching Rezanov for his new book, “Glorious Misadventures, Nikolai Rezanov and the Dream of a Russian America” (Bloomsbury), Matthews discovered a more complicated, and strategically ambitious character than the tragic hero of Russian opera. (The book, published in English in December 2013, is about to appear in Russian). “Let’s put it this way,” Matthews said in an interview with RBTH. “Conchita was not the first teenage heiress in Rezanov’s life.” Matthews is referring to Rezanov’s politically important first marriage to 14-year-old Anna Shelikhova, the teenage daughter of the most important fur trader in Russia, known as the merchant King of Siberia. Closer to Rezanov’s own age was Anna’s mother, Natalia Shelikhova. Upon her own husband’s death, she would manage to wrest control of his fortune and become one of Russia’s first female oligarchs. Natalia is one of the most intriguing – and certainly among the most sane – characters in Matthew’s thrilling book. 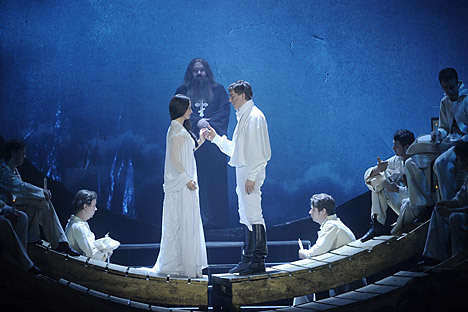 The show about Rezanov’s life that so affected Matthews, “Juno and Avos,” refers to the names of the ships Rezanov sailed to America. The rock opera premiered in 1981 at the Theater of Lenin’s Communist Youth League or “Len-Kom” and still plays to packed houses in Russia today. In the next 300 or so pages, Matthews tells a swashbuckling, epic, and sometimes brutal story—about the Russian America that quite nearly happened at a time when huge swathes of the “new world” were being bought and sold by the monarchs of Europe. Matthews research and travel makes Siberia, Alaska and California come alive with vivid detail and a sense of the enormity of the challenges facing these frontiersmen and women. Matthew’s first book, “Stalin’s Children: Three Generations of Love, War and Survival,” is a memoir centered on the heartbreaking love story of his parents. Mervyn Matthews, Owen’s father, arrived in Moscow in the early 1960s for a graduate program at Moscow State University. He met Lyudmila, the daughter of a Red Army officer who was purged during Stalin’s Terror. The couple fell in love and married, and just as hastily, Matthews was deported. When they were finally reunited several years later, Mervyn Matthews had compromised his own academic tenure to win his beloved’s release. His career was in tatters. Lyudmila had her own demons; she was raised in an orphanage as her own mother, Owen’s grandmother, languished in a Soviet prison. Matthews tells the story lovingly, and it is at times hard to bear. The 2008 book was shortlisted for the Guardian First Book Award and was a Book of the Year in the Sunday Times and Sunday Telegraph.